The original two storey premises is of brick construction with rendered elevations under a multi pitched slate roof and benefits from single storey extensions of similar construction to the rear. The Property provides trade and ancillary storage areas at ground floor level with managers accommodation above. Externally there is a yard to the rear with delivery access to the side. 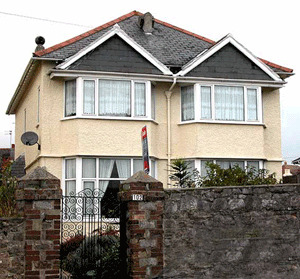 From 1920 Harry Bird and his family were listed as living at Haytor View , Vane Hill Road. His two youngest daughters were born there in 1921 and 1923. Harry was listed as being a conductor of a motorbus and then a booking clerk at a motor garage on the certificates. They remained there until c 1928. "I wonder if that library in India has any record of events in Adyar Torquay... I believe there were Theosophist magazines. I distinctly remember dad telling me about Dudley and him playing table tennis with young handsome Indians at Adyar as if it was a regular thing.
" Torquay as a Health Resort" and the "Manual of Vegetarian Cookery " in 1908. There was already a well established group of Vegetarian Guest Houses, Health Food Shops and restaurants in the town by the First World War including his own " Dartmoor House " in Belstone where his cook Miss Disham served delicious vegetarian food to guests. 1902 saw the first advertising campaign to bring healthy visitors to Torquay - rather than people recovering from illnesses. Torquay changed in character from being a winter holiday resort to being a summer holiday resort. Rail traffic increased steadily until WW1. (During WW1 soldiers were brought to Torquay to recover from their injuries.) After the Great War an effective advertising campaign by The Great Western Railway Company was responsible for making Torquay a major resort. The busiest day was on August Bank Holiday in 1938, just before the outbreak of WW2, when 20,000 passengers arrived in Torquay station, followed by 50 trains the next day. Around 1930 Harry Bird acquired the hotel and changed the name to Adyar after giving up a B & B business in Preston. It was a large place with about 30 bedrooms attached to a church. It was very popular as was the only establishment in town that catered for vegetarians. People came down from the North for Wakes weeks, Saturday to Saturday. Sometimes there were so many guests that Dorothy used a terrace of private houses down the road to sleep the overflow of guests but they all ate in the Hotel. So sometimes there were over 80 covers in the restaurant, three meals a day. They hired their staff from Wales, girls left school in those days at 14, there were some big families in Wales, when an older sister came down to work and had younger ones, as soon as they were 14 they came down to the hotel to work as well. Sometimes there were three or four from the same family who stayed years. When Harry's two youngest daughters were about 12 and 14 they were sent to work there as well. They were put in an attic room which was absolutely ghastly. Dorothy was very particular and only had starched linen sheets, tablecloths and napkins (these were changed daily) It was the two girls' job to wash all this linen at the back of the hotel. There were two enormous mangles. They had to soak the sheets with a blue bag and rinse them. Everything was done by hand. Then put them through the mangles. The handles were so heavy that the pair of them had to swing on them with their full weight to get the sheets through. They had to do this time and time again then hang everything on the lines, the linen was so flat by the time they had finished that it hardly needed ironing when dry. One daughter often caught a chill and became 'delicate' in health from then on. Thalia never helped out as she already had a bad chest, any way by then she was working in the Pansy Byrd Dancing School. The rest of the family lived at Esdaile which at that time was rented. Warren was born there and Thora, Lilian, Florence and Iris gave the Hotel as their home address on their marriage certificates. Adyar in 1935 the sum of 2½ gns a week was charged for full board up until the war. Then during the war the Prudential Assurance Company in their entirety came down to Torquay and commandeered every hotel room they could get their hands on for their staff and offices. They even bought the village of Cockington. Harry Bird charged 5 gns for the 'full works' for each member of staff and this was a great little earner. The family moved to Esdaile for the duration of the occupation which was purely a family home and did not have letting rooms. After the war the prices never went down and the charge continued at 5 gns a week. There was great competition for guests, either the hotel had their own taxi which would wait at the station to bring guests to the Hotel, or backhanders were given to drivers to make sure that they brought clients directly to your hotel. The station forecourt was 'awash' with touts who were paid to send the guests directly to the hotels on foot. This of course benefited the establishments which were within walking distance. Loads of people came down 'on spec'. It was amzing to see that Adyar advertised a garage as most people came by train in those days. This was a large house rented by Harry for the family before or around the time when Adyar was taken over in the war. Most of the family lived there on & off including Gertrude and perhaps Lilian and various others. Harry put Barbara Lena 'Butler' and her son Derek up there in a room when they came down to join 'John Watson' and had nowhere to live. One or two grandchildren were born there. During the war the MOD came round and commandeered any spare rooms anyone had for refugees. Esdaile was sent a French Jewish couple with the husband's mother to stay. The husband was about 40 and the wife 21. They were quite well off in France being something to do with Rolls Royce? Both husband and wife spoke English but not the elderly mother. They had two small rooms, later the young wife had two babies and the family stayed in touch with them for years after they had returned to France. note: Esdaile was named after a volume of early poems by Shelley 'The Esdaile Notebook' . Shelley was one of Gertrude's heros. These were a row of three coastguard cottages on the top of the cliff owned by Lord Churston. Thalia was always a sickly baby and had a weak chest. The way Mansands came about was that when Maurice Childs and Lilian Bird were courting they used to go to the beach there . A lady in the second cottage used to do teas, so after a swim they used to go there for lemonade. One day she told them that the next door cottage was for rent as Lord Churston had gone abroad. Lilian told Harry in the evening when she got home and he immediately made arrangements to take on the lease. He then moved Thalia and the two youngest girls there from Brixham with the hope it may improve Thalia's chest. Later this lady gave up her tenancy and Harry took over that cottage as well. They carried on doing the teas quite successfully and in the summer sold lemonade chocolate and sweets. Sometimes Harry's eldest daughter Thora went down to help out when her children were small. The Bird girls used to walk the three miles to school and back to Brixham every day. They brought back the milk on their way home. On Saturdays Gertrude took them all to Brixham shops on foot to do the weekly shop and they all had to help carry the heavy bags on the walk home. This happened in all weathers as there was no car in the family then and no bus service. During this time Harry became treasurer of the local newspaper. Later John Healey acquired the lease to one cottage and it remained in the family for sometime. In 1952 it was announced that Dorothy had bought the Bakery in Kingkerswell lock stock and barrel, so they had to move out of Little Meadow as they were taking over the business .Norman then took over at Widecombe. The Bakery belonged to Charles Bovey with his sister living in the accommodation. She bought a property along the village street with some of the proceeds of the sale so was still local. Another sister also lived in the village. The business went from strength to strength being one of the only suppliers of wholemeal bread and natural products in the area. A van was purchased and deliveries made to other shops and guest houses in and around Torquay. Grandchildren helped out when they obtained their driving licences. Later a café was built in the old stables of the premises serving breakfasts lunches and teas. It was virtually a 24 hour day! A property rented by Harry Bird to house Thalia for when Irving Slome came to visit. The low whitewashed houses by Mansands beach were originally built by prisoners of war during the Napoleonic wars. The curious little manmade grotto by the beach at Mansands is a limekiln. Lime was burnt in the kiln and then spread on the fields to reduce the acidity of the soil. It was also used to make lime mortar and lime wash for painting houses. To try and improve the wheat harvest - and in turn the war effort - during the Napoleonic wars, farmers were paid an annual subsidy for having a limekiln on their land during the early 1800s. The Coastguard Service came about mainly as a result of a reorganisation of other existing services used at combating the hugely profitable smuggling activities that has been in action during the early part of the 19th century. Since then, it has undergone many further reorganisations until, it is now responsible for ship and coastline safety. There appeared to be 5 cottages at that time, with other Coastguards William Slaney no 2, Marwood Small no 3, John Connor no 4 and William Shute no 5, all described as Navy Men on the census living with their families. and his wife. This information was discovered by chance whilst researching the Rumsey family ( Norman Bird's wife) as one of William's daughters married a Rumsey. All a little bit of history about the cottages which the Bird Childs and Healey families loved so much. In 1893 the 'Mayfly', a river paddle steamer, was bought in Liverpool for £700 and fitted out as a hospital ship at a further cost of some £500. It was ready for use by September, more than 22 years after Dr Buchanan's original recommendation! Initially the ship was moored on the Kingswear side of the harbour near the Higher Ferry. It had two wards and accommodation for 25 patients. A caretaker was appointed to live on board with his wife and cope with maintenance and the nursing of patients. One of the early admissions to the floating hospital gives some idea of he hazards of life at sea in those days. The barque 'Merle' arrived in Dartmouth from Mauritius on the 25th November 1893, having had three deaths on board - on the 15th, 19th and 23rd. The last mentioned was still in his bunk on arrival. A fourth man was taken to the 'Mayfly' in a seriously ill condition and died on the 27th November. The diagnosis was said to be malaria. Most of the patients admitted on board the 'Mayfly' appear to have arrived by sea, although inhabitants of the town were certainly eligible for admission. In June 1893 the Town Council were informed that the Port Sanitary Authority would take cases of infectious disease on the ship for £1-1-0 per week. This would cover medical attendance, but not the cost of burial! The charge was raised the following year to £1-15-0. There seems to have been a certain bias against floating hospitals, as one member of the Sanitary Authority resigned over the question when they failed to obtain a site on land and, at an earlier debate, mention was made of the unpopularity of floating hospitals amongst the poorer classes. The exact significance of these enquiries was made quite clear by notice of a resolution given by Mr Mitchelmore for the next meeting which referred to reducing the expenses of the hospital ship either by reducing the wages of the caretaker or obtaining a new caretaker at less remuneration; This resolution was duly passed in January 1895, reducing Mr Farley's wages to 15/- per week, a reduction of 40%, with the proviso that, if he declined to accept the terms, he should be given a month's notice and an advertisement placed for a successor, preference to be given to a naval pensioner. One suspects that the preference for a naval pensioner was inspired not so much by an affection for the senior service as by the calculation that someone already in receipt of a pension might accept a lower wage! In the event Mr Parley accepted the cuts and stayed on. He was to some extent compensated for his loyalty as accounts for 1894 and 1895 show considerable payments to him for 'additional nursing'. These came to £50 in 1894 and £65.5.O in 1895. In April 1896 he was instructed to paint the outside of the ship, 'as suggested in his report', and was given the help of a man for a week to do this. nuisances to get a guarantee from the captain or agent to pay all expenses in the same way as adopted by the cottage hospital.' In March 1898 Mr Parley's wages were again considered. After a lengthy debate it was agreed that these be raised from 15/- to £1 per week. At the same time fears were expressed that the Totnes members of the Authority, who were not present, might not be in agreement with the decision. These fears were fully justified! At the June meeting of the Authority the Totnes members turned up in force, including one member who had only attended once in the previous three years! After a further prolonged debate a motion was passed rescinding the March decision and reducing Mr Parley's wage to 15/- once again from the 16th July. The Dartmouth Chronicle published a highly critical editorial on the decision, but this was of little use to Mr Parley. He must have resigned soon after as, in April 1899, a Mr Wilkins was appointed in place of Mr Willis who had a temporary appointment. Mr Wilkins did not stay long, and in April 1901 a new caretaker was again appointed - at 17/6 per week. The Coastguard Station at Mansands was in use from the 1850s and was still operational in about 1910/11. It probably closed when the men were recalled to the Navy at the outbreak of World War 1, it never reopened. 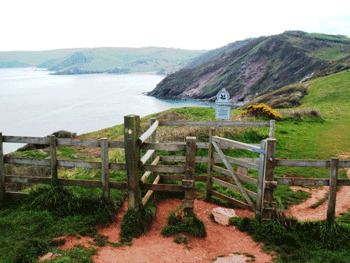 Mansands to Froward Point [Parts of this are now designated the Coastal Footpath]. During World War 11 the Coastguard Service was placed under the Ministry of Shipping (later the Ministry of War Transport) The "dawn patrol", used against smugglers in the 1840s, was re-introduced, although they now watched for spies and saboteurs, mine-laying aircraft and drifting mines. All Coast Guards wore battledress and carried rifles or sten-guns. To assist the regular officers more auxiliaries were recruited; by 1940 there were 5,000 of them. With some reluctance, responsibility was restored to the Trade department in 1945, which, after various name changes, is now the Department of Transport. Harry Bird rented all three cottages from Lord Churston possibly from the early '30's. The Healeys took over the rent from Dorothy and had the cottages for about 20 years in their own name. They always regretted giving up the lease. They paid £15 per month for all three and had to go in person to pay the money to 'Waterson' the agent on 'Lady Day' (?) They actually lived in the Coast Guard Cottage but Gertie lived in the Watch Cottage and used to do Teas in the summer months to make a 'bit of pin money'. She lived there for years and brought up Thalia, Iris and Joy who had to walk to school everyday to Brixham over the hill. They decided to give it up after the roof was damaged badly one winter by an escaped convict from Princetown who had set up home there and virtually wrecked the place. He gained access through the roof. Iris couldn't bear to go back there and they left most of the fixtures and fittings in situ. In fact when Janice and Claire visited two or three years ago they recognised some of the family furniture through the window including the iron bedstead! In the 1970s a rich farmer bought Triggles Farm ... he drained the marsh, grubbed out hedges and cut down woods.There were wild impenitrable unspoilt woods in the valley which ran down to the sea. The last part of the stream in the wider valley was a marsh full of wild life and flowers. The local lads killed adders every year where the marsh drained into the sea. The red devon rocks and soil could be seen in the road /path down from Triggles farm on one side of the valley and the slighty better unmade road on the other side. Evans Farm was situated here with two cottages on the opposite side of the road . Part of the lower road was very wet and almost impassable in wet weather.There were two derelict cottages in the dark woods by the wet overflowing stream at the bottom of the valley at the head of the marsh. Nowadays the National Trust manages much of this area, including Mansands beach.